Four-color process printed on both sides of 12pt C2S White Semi-Gloss stock. Coated with Aqueous Gloss. C3 business card slits on center pocket. Power Services Group's red, black, and gray logo appears on the belly band. 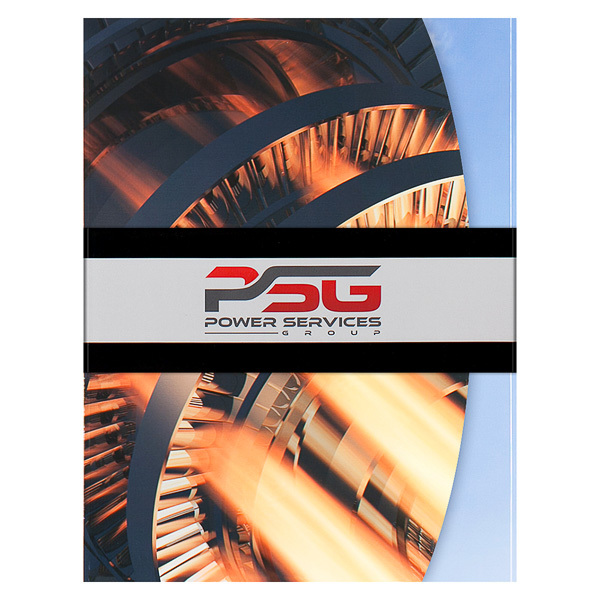 The close-up cover photo and interior images depict PSG's steam, gas, and other turbines. The left panel includes a complete product list, while the right inner panel provides brand information. On the back, recipients can learn more about the brand or contact its South Carolina headquarters. Four-color process printed on both sides of 12pt C2S White Semi-Gloss stock. Coated with Aqueous Soft-Touch. 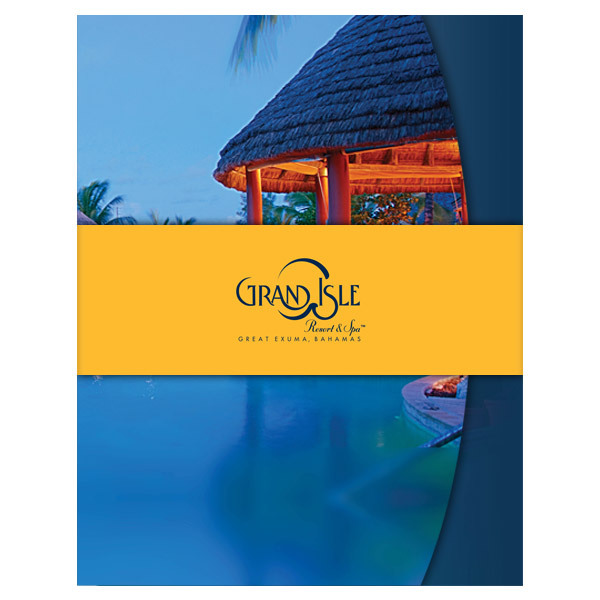 Playing on Grand Isle Resort & Spa's blue and yellow logo, a canary yellow belly-band wraps around a full-color photograph of the resort enveloped in the rich, deep blue hues of twilight. The glow of light from the hut is even placed so it illuminates the belly-band and logo, reinforcing the brand's identity. Two of the three inner panels sport an extra large colorized image of the resort. A row of small pictures reveal the beauty of the resort property in the light of a tropical sun, complete with maps on the far right panel to guide tourists around the property and local areas. Deep blue pockets on the center panel carry on the twilight theme, resembling the color of the sea at dusk. 1 debossed area and 2 foil stamped areas on Side 1 of uncoated 122lb Neenah Plike Brown stock (currently unavailable). Real estate agency Uncommon Ground pays tribute to its home state of Montana with a rustic color palette. Brown panels are reminiscent of prairies and mountains, with Metallic Green foil implying nature and plant life. Under the belly-band is the agency's logo; its combination of clear foil stamping and debossing creates a reflective, indented area. Bright green foil on the right exterior panel spells out the brand's values. Four-color process printed on both sides of 120lb C2S White Gloss stock coated with Aqueous Gloss. 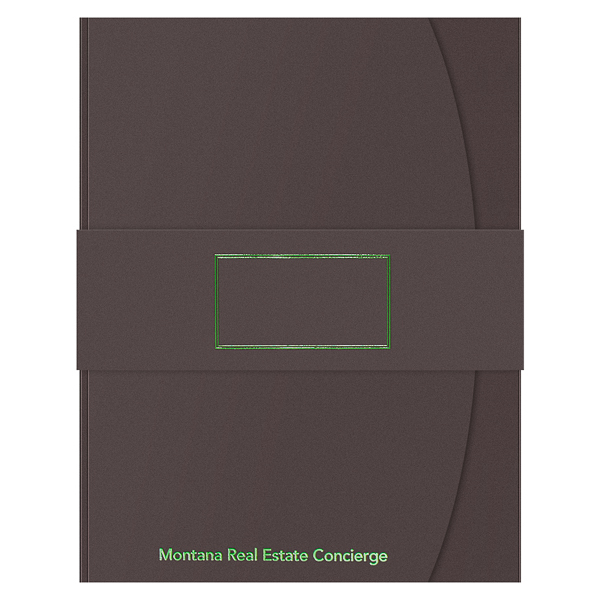 C3 business card slits on the center pocket. Matthews Environmental Solutions' products are the stars of this design. 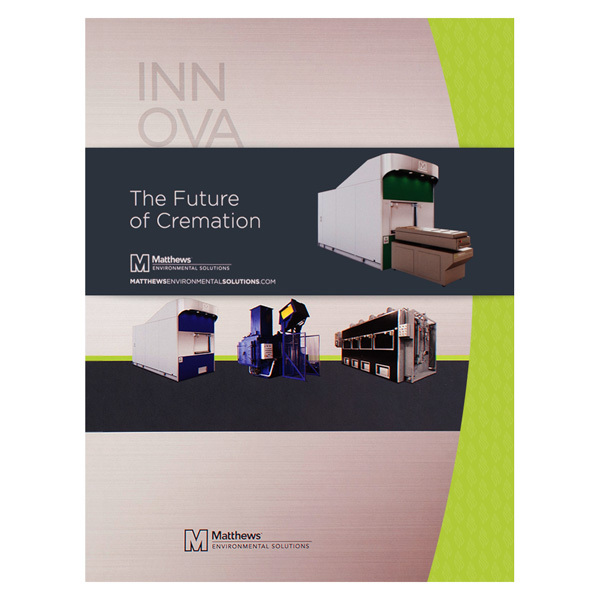 A cremation machine is featured on the belly band of the folder. Three others line the center of the rounded cover. The words "Innovation," "Connected," "Evolution," "Tradition" and "Responsive" are prominently featured on each panel with a flame in the center of each lime green "O" in the words. More products are displayed on the back. A wrap-around belly band creates an engaging, interactive user experience. The band latches with a tuck tab, holding the covers shut. Decorate the band with brand information, a logo, or a bright color to increase visual impact. The front cover is die-cut on a curve, exposing part of the right panel and giving a sneak peek into the interior. Two flaps at the top and bottom of the center panel hold up to 15-20 sheets of 8 1/2" x 11" print media in place. With this two-in-one package, you'll also receive free matching promotional or business cards. Dimension Open: 25 1/4" x 11 1/4"